Building your online boutique’s presence on Facebook lets you reach customers in a personal and unobtrusive way. It can be difficult, for example, to get potential customers to trust you with their email address for your mailing list, but people are much more free with their ‘followers’ and ‘likes’ on Facebook. Let’s look at 6 key ways to boost the amount of likes on your posts, ensuring your brand appears on a growing number of Facebook users’ news feeds every day. 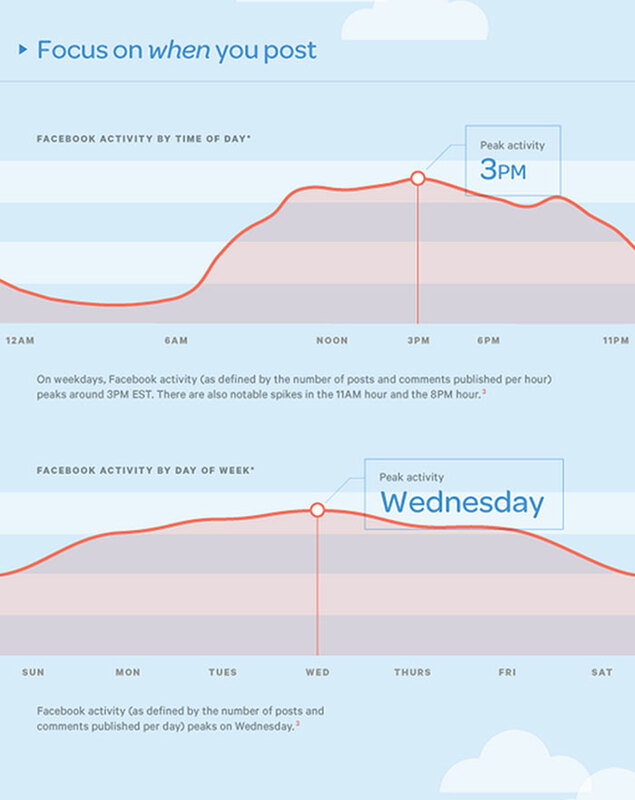 When is the best time to post on Facebook? This can be tricky for international brands that cover a wide array of timezones, but if most of your customers are from the UK or Europe then the formula is fairly easy: think of the times of the day that you’re most likely to need a distraction. It turns out that Facebook activity reaches peaks throughout the workday at times that you’d expect: first at around 11 a.m., when you’ve likely completed a fair bit of work and need a distraction before lunch; and then again at 3 p.m., when the after-lunch lull takes hold and you need a distraction before going home for the day. At 8 p.m., usage spikes again as people settle down on their sofas to unwind after dinner. Of course, you can post at other times, but posting at these times is more likely to get your brand at the top of the maximum number of newsfeeds. Don’t worry if you don’t have time to physically press the ‘post’ button at these times, as you can easily schedule your posts for specific times throughout the day, both through Facebook and a number of social media managing apps. Now that you know when to post, let’s talk about what to post. It will be tempting to post links to your website store, particular products, or blog entries with a short description of the link in the status, because the status-and-link combo is how most of us use Facebook in our everyday lives. 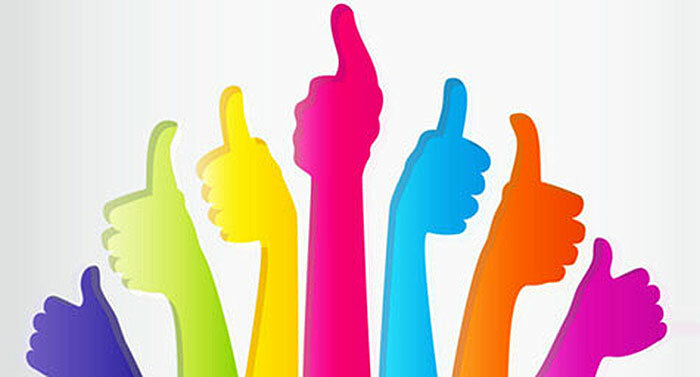 However, in today’s visual world, you’re much more likely to boost your likes if you post an image. According to KissMetrics, posts with photos get 53% more likes, 104% more comments, and 84% more click throughs than status-and-link posts. Again, think of your own user experience and how much more likely you are to press like on a funny, beautiful, or cute picture than on a link that you may not ever click on or have time to read. This doesn’t mean you can’t post links to pages on your store or blog -- in fact, you should -- but that you need other content to boost your likes and ensure that your status-and-link posts are seen! 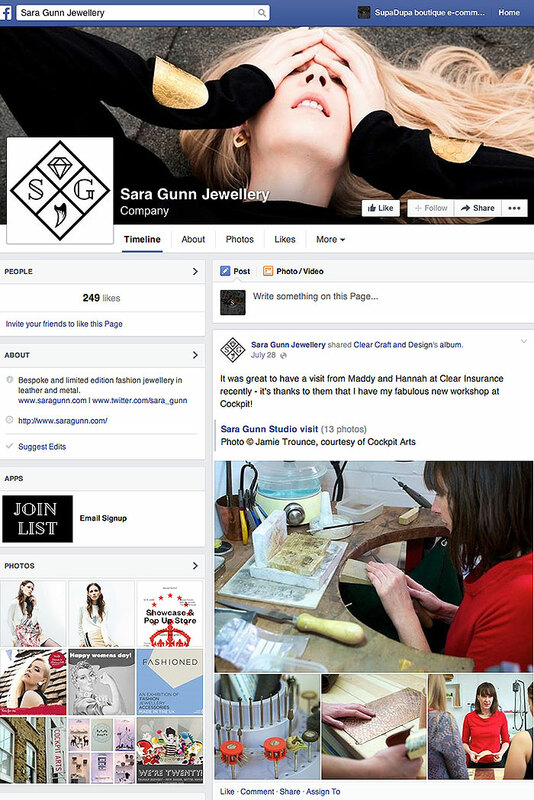 Sara Gunn a Jewellery Designer from SupaDupa, show a great example of posting engaging content which matter to her customer base. Of course funny pictures of cats are internet staples, and you probably know of or follow Facebook pages dedicated entirely to posting funny memes like this. They’re always a winner as far as getting likes. However, since you’re here to build your brand and get customer engagement, you’ll have to find a balance between courting likes and showing off your products. Always stay true to your brand, posting images that your customer would want to see: if you’re selling baby clothes, that means parenting memes. Handmade ‘geek chic’ jewellery means nerdy humour is likely to play well with your crowd, while higher-end accessories shops may want to focus more on beautiful images that highlight elegant design. You know your customer, and in many cases you’re your own ideal customer, so trust yourself! Lastly, you can use smartphone apps or simple computer programs to overlay text onto your photos, conveying important information like ‘$10 off this Boxing Day!’ or ‘Special Giveaway!’ in a graphic and visually appealing way. Posting images like these, with a link in the status if you choose, are much more likely to get liked on Facebook than a text post and a link to your online boutique. RIngsandTings a fashion based store on SupaDupa, show an awesome example of their latest offer via their Facebook page. An important thing to remember is to try and upload images to Facebook yourself (giving the proper credit when necessary, of course) as this way every ‘share’ the picture receives will count towards your total number of shares, making your brand look more popular, and link back to you. If you find a funny picture on another Facebook page simply press ‘share’, your post will get liked but any shares from your customers will be credited back to the page that uploaded it. That means instead of saying ‘Jane Doe posted an image via Your Online Boutique,’ Jane’s Facebook friends will see ‘Jane Doe posted an image via Someone Completely Different.’ You don’t want that! Of course, sharing photos from another page fosters goodwill from those pages, giving them a signal boost and making them more likely to share and like your posts as well. You’ll find the right balance for you as you use Facebook more and more successfully. 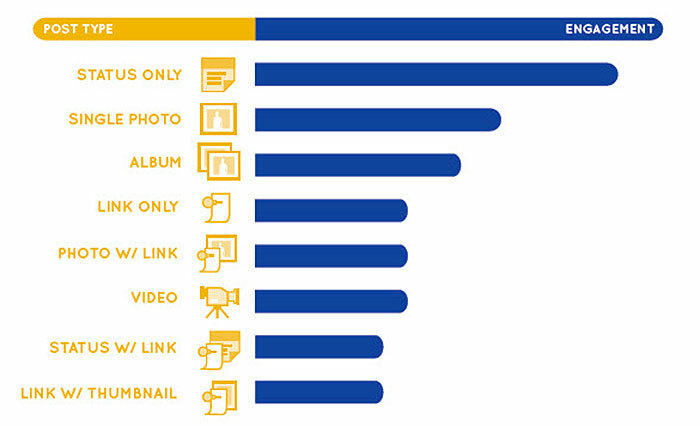 While images are much more effective at boosting Facebook likes than status-and-link posts, the posts that get the most attention overall are text-only status posts. Facebook tends to prioritise these posts and put them on more newsfeeds, and you’ve probably noticed that your own text-only statuses receive more likes than when you post a status with a link. However, for brands, people don’t want to spend a lot of time reading, so keep your status updates short, sweet, and to the point! Posts with 80 characters or fewer had 66% higher user engagement than longer posts, and ultra-concise posts of 40 characters or fewer faired even better still. Of course, this isn’t your personal newsfeed so what are you supposed to say to your followers beyond updates about your business? You shouldn’t be afraid to let your personality and thoughts shine through on your brand’s Facebook page, as many people truly seek that out when they shop with a small business rather than a large, faceless company. However, for the days that you’ve out of things to say that are relevant to your consumer base, there’s a proven way to get people talking: just ask them about themselves! Text-only Facebook statuses that ask questions get 100% more comments than non-question posts, while fill-in-the-blank statues such as ‘My favourite part about summer is...’ get 9 times more comments! Make sure to like comments yourself, and engage with your customers by laughing with them, agreeing with them, or telling your own stories, and you’ll cultivate a community that actively engages with your brand. Lastly, while you may want to ask 100 questions a day once you realise that they get more likes and comments, it’s crucial not to flood your customers’ news feeds. According to research from Buddy Media, an ideal number of posts per day is 1-2, as this number gets 40% more engagement than brands that post 3 or more posts a day. Brands that post 1-4 times per week get 71% higher user engagement than brands that post 5 or more times per week. A great website providing information on design, marketing and social media. Blog on sharing, creating, analysing and converting with social media.